As a sort of prelude to this post, I would like to introduce myself. My name is Ashu Rao and I am going into my senior year at UNH as a marine biology major. Jo recently added me as a contributor and I want to express my gratitude since I’ve always been an avid reader of this blog. I hope you enjoy my first post. The Surroundings. 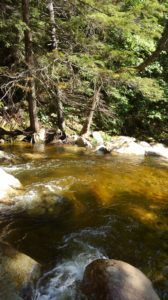 Headwater streams are often times nestled deep in the woods in high elevation areas. These areas for the most part are unbesmirched by human development and therefore have the ability to appear truly wild. Having lived in Southern New Hampshire for most of my life, I’m always reminded of day to day life. Even at local trout streams, I am always within sight of a busy road and I inevitably share water with other anglers. Don’t get me wrong, I have no problem sharing water with other rule abiding and respectful fishermen. I am a huge supporter of conservation and protection of public land rights, however occasionally, I do yearn to find solitude and headwaters grant me this escape. In a way, these streams almost paint a picture in my mind of how I think things used to be: just an angler and a stream full of wild fish, nothing else matters in that moment. The Fish. This almost goes without saying. The endgame of fly fishing is to fool a fish (or more) into taking a carefully presented fly, right? Well, yes but that’s not the point here. Like I said earlier, many of the fish that you catch in these streams are small. Most of these streams are nutrient poor, so they host fewer resident hatches, lowering growth potential. 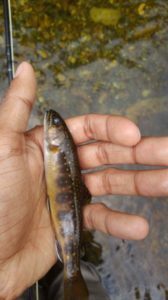 To add to that, the average lifespan of native brookies in small mountain streams is only 5 years if not less in some cases. You aren’t going to the catch an 18 in. trophy out of a 20 ft. wide mountain stream, that’s a fact, but you will catch something that is so uniquely wild and beautiful in itself that size really won’t matter. Unlike hatchery reared brookies, natives show a wide range of color variation even within the same stream! Some have halos, some don’t. Some have pink belies, some have orange. There is just so much variation in a native stock, you really don’t know what you will get and that is part of the fun. The Simplicity. Catching these fish really isn’t rocket science since they aren’t all to selective. Not many hatches go on in these streams so the fish are fairly opportunistic to begin with but, this leads to the misconception that these fish are stupid. In fact, they are far more wily and spooky than their hatchery reared counterparts so any mess up or misstep can send these fish into the next county. However, this can be avoided through simple fundamental fishing. Keeping a low profile, mending the line (in fact keeping as much fly line off the water as possible), and limiting your number of false casts and backcasts in general are some of the things you can do to increase your success on your next outing. Also, just like any fishing, adjust your techniques to water conditions. Although small stream natives tend to hit dries more often than their stocked or big water counterparts, it wouldn’t do you any good throwing dries into fast, broken, swirling water; that is better saved for nymphing. I love this post. I have become a cold water fishery snob after growing up on warm water species. The salmonoids tend to live in pure, pristine places often alpine in nature. I love the magic light at dawn and dusk. Catching monsters in the tailwaters is super fun too. But the headwaters tend to be where the best overall experience happens for me; Mountains, vistas, granite slabs, solitude and big puffy clouds , And I agree the beautiful little wild fish are stunning. Thanks David! I too started off as a bass fisherman but trout are really something else. I enjoy tailwaters from time to time since they have larger fish and sometimes even their own resident wild fish. 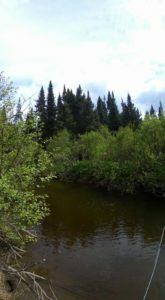 I am actually headed to a popular tailwater in the Great North Woods this coming Sunday. Great post! It prompts me to target headwaters, if possible. In summer, I tend to fish tailwaters and get there while it’s still dark. I should push myself to find some headwaters…. 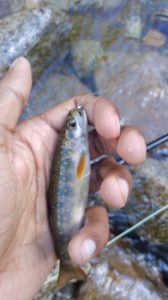 Ashu, I loved reading your well written article on small stream fishing. There is something very special about catching the native char of New England, the survivors despite centuries of development in this region. Given a chance, they find a way. I live in a suburban setting, but still know haunts nearby where the native brookies continue on. You have inspired me to give them a go!